Subcultures, the new three tier design from JConcepts are the latest in Short Course tire development. It’s a whole new world down within the tread as the Subcultures are the first Short Course tire with three tier lug technology. The precisely spaced pyramid shaped tread provides the initial feel and control for hard packed, loose and loamy conditions while the step base give the necessary height for wet and soft conditions. At the very base of the Subcultures is a mesh of tread which provides grip at a time when most tires are left bald. Available in Super Soft Green compound the Subcultures for Short Course are a specialty tire that when matched to the appropriate track can provide the performance and all around tire that racers dream of. Additionally, the Subcultures include precisely molded Force-1 inserts which fill and proportion the tire specifically between tire and wheel dimensions. 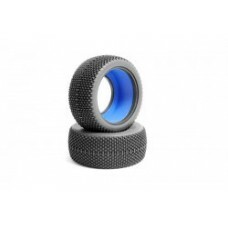 The Subcultures are a part of the JConcepts special breed of tire, designed for maximum performance when new or used as the design allows even wear all the way down to the tire body. Subcultures in new condition excel on hard or soft surfaces that are either dry, wet or where mixed conditions are present. Worn Subcultures on the second or third tier of lugs excel on surfaces where a groove has formed with minimal dust buildup.